Hehir, Aidan 2019. Hollow Norms and the Responsibility to Protect. p. 1. Hehir, Aidan 2019. Hollow Norms and the Responsibility to Protect. p. 87. Panebianco, Stefania and Fontana, Iole 2018. When responsibility to protect ‘hits home’: the refugee crisis and the EU response. Third World Quarterly, Vol. 39, Issue. 1, p. 1. Richmond, Oliver 2018. Human rights and the development of a twenty-first century peace architecture: unintended consequences?. Australian Journal of International Affairs, p. 1. Hehir, Aidan 2017. “Utopian in the Right Sense”: The Responsibility to Protect and the Logical Necessity of Reform. Ethics & International Affairs, Vol. 31, Issue. 03, p. 335. Erdogan, Birsen 2017. Humanitarian Intervention and the Responsibility to Protect. p. 33. Ralph, Jason and Souter, James 2017. Introduction: The Responsibility to Protect and the Refugee Protection Regime. Ethics & International Affairs, Vol. 31, Issue. 01, p. 47. Coen, Alise 2017. Capable and Culpable? The United States, RtoP, and Refugee Responsibility-Sharing. Ethics & International Affairs, Vol. 31, Issue. 01, p. 71. Ralph, Jason and Gifkins, Jess 2017. The purpose of United Nations Security Council practice: Contesting competence claims in the normative context created by the Responsibility to Protect. European Journal of International Relations, Vol. 23, Issue. 3, p. 630. Bellamy, Alex J. 2017. Global Insecurity. p. 311. Bexell, Magdalena and Jönsson, Kristina 2017. Responsibility and the United Nations’ Sustainable Development Goals. Forum for Development Studies, Vol. 44, Issue. 1, p. 13. Etzioni, Amitai 2016. Defining Down Sovereignty: The Rights and Responsibilities of Nations. Ethics & International Affairs, Vol. 30, Issue. 01, p. 5. Cunliffe, Philip 2016. From ISIS to ICISS: A critical return to the Responsibility to Protect report. Cooperation and Conflict, Vol. 51, Issue. 2, p. 233. TACHEVA, BLAGOVESTA and BROWN, GARRETT WALLACE 2015. Global constitutionalism and the responsibility to protect. Global Constitutionalism, Vol. 4, Issue. 03, p. 428. 1 Understood here as genocide, war crimes, ethnic cleansing, and crimes against humanity. 2 For this view see Rotmann, Philipp, Kurtz, Gerrit, and Brockmeier, Sarah, “Major Powers and the Contested Evolution of a Responsibility to Protect,” Conflict, Security & Development 14, no. 4 (2014), p. 356. The central thesis of this article is that the evidence of practice suggests that RtoP itself has become significantly less controversial. The “growing controversy” view rests almost entirely on the conflation of RtoP with the debate over intervention in Libya. 3 “Effective Prevention Requires Early, Active, Sustained Engagement, Stresses Secretary-General at Ministerial Roundtable on ‘Responsibility to Protect,’” UN document SG/SM/13838, September 23, 2011. 4 See Tim Dunne and Gifkins, Jess, “Libya and the State of Intervention,” Australian Journal of International Affairs 65, no. 5 (2011), pp. 515–29; and High Level Advisory Panel on the Responsibility to Protect in Southeast Asia, Mainstreaming the Responsibility to Protect in Southeast Asia: Pathway Towards a Caring ASEAN Community, September 9, 2014. 5 Tiewa, Liu and Haibin, Zhang, “Debates in China About the Responsibility to Protect as a Developing International Norm: A General Assessment,” Conflict, Security & Development 14, no. 4 (2014), p. 408. 6 Katzenstein, Peter, “Introduction,” in Katzenstein, Peter, ed., The Culture of National Security: Norms and Identity in World Politics (New York: Columbia University Press, 1996), p. 5. 7 Ban Ki-moon, Implementing the Responsibility to Protect: Report of the Secretary-General, UN document A/63/677, January 12, 2009, para. 13. 8 International Commission on Intervention and State Sovereignty, The Responsibility to Protect (Ottawa: IDRC, 2001). 9 See Doyle, Michael W., “International Ethics and the Responsibility to Protect,” International Studies Review 13, no. 1 (2011), p. 82. 10 Wheeler, Nicholas J., Saving Strangers: Humanitarian Intervention in International Society (New York: Oxford University Press, 2000), pp. 143–44. 11 Cases based on Alex J. Bellamy, “Mass Atrocities and Armed Conflict: Links, Distinctions, and Implications for the Responsibility to Prevent,” Policy Analysis Brief for the Stanley Foundation, February 2011, appendix. 12 Strauss, Ekkehard, The Emperor's New Clothes? 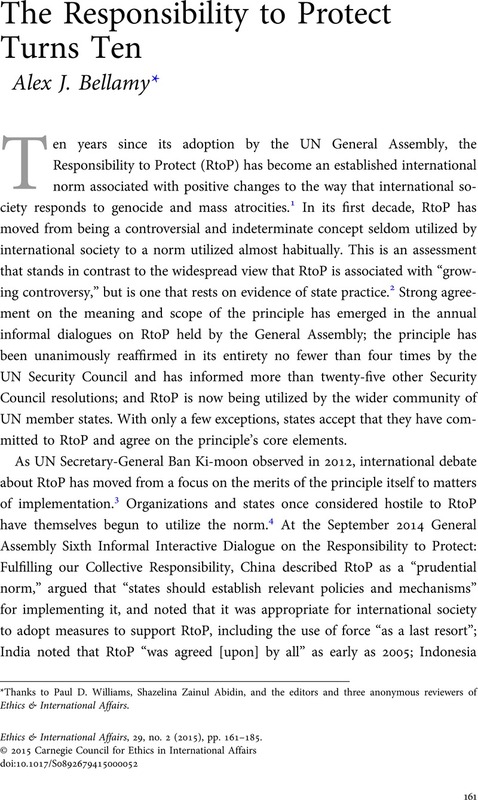 The United Nations and the Implementation of the Responsibility to Protect (Berlin: Nomos, 2009), pp. 57–58 . 13 On Kenya: Annan, Kofi, Interventions: A Life in War and Peace (New York: Allen Lane, 2012), pp. 189–202 . On other cases at this time, see Bellamy, Alex J., Global Politics and the Responsibility to Protect: From Words to Deeds (London: Routledge, 2011). 14 Strauss, Emperor's New Clothes?, p. 58. 15 Res. 2147 (2014), March 28, 2014. 16 For summaries of these debates and full publication of the statements by member states, see the Global Centre for the Responsibility to Protect: www.globalr2p.org. 17 “Statement by the President of the Security Council,” UN document S/PRST/2011/16, August 3, 2011. 18 UN document S/PV.6627, October 4, 2011, pp. 3 and 5. 19 Statement by Mr. Abhishek Singh, First Secretary, Permanent Mission of India to the United Nations at the Informal Interactive Dialogue of the General Assembly on the Responsibility of States to protect their populations by preventing genocide, war crimes, ethnic cleansing and crimes against humanity through appropriate and necessary means, September 8, 2014. 20 Gilmour, Andrew, “The Future of Human Rights: A View from the United Nations,” Ethics & International Affairs 28, no. 2 (2014), pp. 239–50. 21 Compare Pattison, James, Humanitarian Intervention and the Responsibility to Protect: Who Should Intervene? (Oxford: Oxford University Press, 2010); and Perkins, Heather Roff, Global Justice, Kant, and the Responsibility to Protect: A Provisional Duty (London: Routledge, 2013). 22 Chesterman, Simon, “‘Leading from Behind’: The Responsibility to Protect, the Obama Doctrine, and Humanitarian Intervention After Libya,” Ethics & International Affairs 25, no. 3 (2011), p. 279. 23 Res. 2171 (August 21, 2014), Res. 2150 (April 16, 2014), Res. 2117 (September 26, 2013), Res. 1894 (November 11, 2009), Res. 1706 (August 31, 2006), Res. 1674 (April 28, 2006). 24 UN document S.PV.7155, April 16, 2014, p. 19. 29 Shannon, Vaughn P., “Norms Are What States Make of Them: The Political Psychology of Norm Violation,” International Studies Quarterly 44, no. 2 (2000), p. 297. 30 UN document A.66/L.36, February 16, 2012. 31 UN document GA/11266, August 3, 2012. 32 “UN Report: Security Council ‘Bears Responsibility’ for War Crimes in Syria,” Al Jazeera, March 5, 2014. 33 Welsh, Jennifer M., “Implementing the ‘Responsibility to Protect’: Catalyzing Debate and Building Capacity,” in Betts, Alexander and Orchard, Phil, eds., Implementation and World Politics: How International Norms Change Practice (Oxford: Oxford University Press, 2014), p. 126. On Luck, see Bellamy, Alex J., The Responsibility to Protect: A Defense (New York: Oxford University Press, 2015), p. 72. 34 Hehir, Aidan, “The Responsibility to Protect: ‘Sound and Fury Signifying Nothing?’” International Relations 24, no. 2 (2010), pp. 218–39. 35 Hehir, “Sound and Fury,” pp. 218, 219, and 235. 37 A Hehir, idan, “The Permanence of Inconsistency: Libya, the Security Council, and the Responsibility to Protect,” International Security 38, no. 1 (2013), pp. 137–59. 39 This has been detailed in Bellamy, Alex J., “Libya and the Responsibility to Protect: The Exception and the Norm,” Ethics & International Affairs 25, no. 3 (2011), pp. 263–69; and Bellamy, Alex J. and Williams, Paul D., “The New Politics of Protection? Côte d'Ivoire, Libya and the Responsibility to Protect,” International Affairs 87, no. 4 (2011), pp. 825–50. 40 Wheeler, Saving Strangers, p. 186; and Roberts, Adam, “Humanitarian War: Military Intervention and Human Rights,” International Affairs 69, no. 3 (1993), p. 440. 41 UN document S/1994/905, annex, July 29, 1994. 42 Kroslak, Daniela, The Role of France in the Rwandan Genocide (London: C. Hurst & Co., 2007). 43 See Security Council Resolutions 2042 (April 14, 2012); 2043 (April 21, 2012); 2118 (September 27, 2013); 2139 (February 22, 2014); 2165 (July 14, 2014); 2170 (August 15, 2014). 44 MINUSCA (Central African Republic), MINUSMA (Mali), UNAMID (Darfur), UNISFA (Abyei), UNMIL (Liberia), UNMISS (South Sudan), UNOCI (Côte d'Ivoire). 45 Morris, Justin, “Libya and Syria: R2P and the Spectre of the Swinging Pendulum,” International Affairs 89, no. 5 (2013), pp. 1265–283. 46 Resolutions 1970 (February 26, 2011); 1973 (March 17, 2011); 2016 (October 27, 2011); 2040 (March 12, 2012). 47 “Remarks by the President in Address to the Nation on Libya,” National Defense University, Washington, D.C., March 28, 2011. 49 “Libya: David Cameron Statement on UN Resolution,” BBC News, March 18, 2011, www.bbc.co.uk/news/uk-politics-12786225. 50 Jentleson, Bruce W., “The Obama Administration and R2P: Progress, Problems and Prospects,” Global Responsibility to Protect 4, no. 4 (2012). 51 See, especially, UN document S/PV.6491, of February 26, 2011, in which India, Russia, China, and South Africa all express concern about attacks on the civilian population and use this to explain their affirmative votes. 52 UN document S/PV.6498, March 17, 2011. 53 See Tim Dunne and Jocelyn Vaughn, “Leading from the Front: America, Libya and the Localisation of R2P,” Cooperation and Conflict, online first, June 2014; and Ryan Lizza, “The Consequentialist,” New Yorker, May 2, 2011. 54 E.g., see Gareth Evans, “The Responsibility to Protect: An Idea Whose Time Has Come . . . And Gone?,” Lecture to the David Davies Memorial Institute, Aberystwyth, April 23, 2008. 55 Tiewa and Haibin, “Debates in China,” p. 423. 56 Bellamy, Alex J. and Williams, Paul D., “Protecting Civilians in Uncivil Wars,” in Davies, Sara E. and Glanville, Luke, eds., Protecting the Displaced: Deepening the Responsibility to Protect (Leiden: Martinus Nijhoff, 2010), pp. 127–53. 57 Annan, Interventions, pp. 189–202. 58 Badescu, Cristina G. and Weiss, Thomas G., “Misrepresenting R2P and Advancing Norms: An Alternative Spiral,” International Studies Perspectives 11, no. 4 (2010, pp. 354–74; and Bellamy, “RtoP—Five Years On,” Ethics & International Affairs 24, no. 2 (2010), pp. 150–53. 59 Luck, Edward C., “From Promise to Practice: Implementing the Responsibility to Protect,” in Genser, Jared and Cotler, Irwin, eds., The Responsibility to Protect: The Promise of Stopping Mass Atrocities in our Time (New York: Oxford University Press, 2012), pp. 85–107 . 60 Nicholas Turner, “The Secretary-General,” in Gentian Zyberi, ed., An Institutional Approach, p. 140. 61 Luck, Edward C., “The Responsibility to Protect: The First Decade,” Global Responsibility to Protect 3, no. 1 (2011), pp. 1–13 . 62 UN document S/PV.6531, May 10, 2011. 63 Jess Gifkins, “The UN Security Council Divided: Syria in Crisis,” Global Responsibility to Protect 4, no. 3 (2012), pp. 377–93. 64 Gareth Evans, “The Responsibility to Protect After Syria and Libya,” Address to the Annual Castan Centre for Human Rights Law Conference, Melbourne, July 20, 2012, www.gevans.org/speeches/speech476.html. 65 Welsh, Jennifer M., “Who Should Act? Collective Responsibility and the Responsibility to Protect,” in Knight, W. Andy and Egerton, Frazer, eds., The Routledge Handbook of the Responsibility to Protect (London: Routledge, 2012), p. 110. 66 Blätter, Ariella and Williams, Paul D., “Responsibility Not To Veto,” Global Responsibility to Protect 3, no. 3 (2011), pp. 301–22. 67 David Bosco, “France's Plan to Fix the Veto,” Foreign Policy, October 4, 2013. 68 Richard Gowan, “An Unlikely Push for Security Council Members to Give up Their Veto Power,” Al Jazeera, September 24, 2014. 70 See the chapters by Roland Paris, Paul D. Williams, Sara E. Davies, and Ruben Reike in Alex J. Bellamy and Tim Dunne, eds., The Oxford Handbook on the Responsibility to Protect (Oxford: Oxford University Press, forthcoming). 71 Thierry Tardy, “The Dangerous Liaisons of the Responsibility to Protect and the Protection of Civilians in Peacekeeping Operations,” Global Responsibility to Protect 4, no. 4 (2012). 72 Paul D. Williams, “The Responsibility to Protect, Protection of Civilians, and UN Peacekeeping Operations,” in Bellamy and Dunne, eds., Oxford Handbook. 73 McLoughlin, Stephen and Mayersen, Deborah, “Reconsidering Root Causes: A New Framework for the Structural Prevention of Genocide and Mass Atrocities,” in Ingelaere, Bert, Parmentier, Stephan, Haers, Jacques, and Segaert, Barbara, eds., Genocide, Risk and Resilience: An Interdisciplinary Approach (Basingstoke: Palgrave, 2013). 74 de Waal, Alex, “Dollarised,” London Review of Books 32, no. 12, June 24, 2010 . * Thanks to Paul D. Williams, Shazelina Zainul Abidin, and the editors and three anonymous reviewers of Ethics & International Affairs.